An antiqued white finish decorates this lantern’s hinged door and geometric accents, creating the perfect space to shield a candle from the elements. With a classic style, this lantern is sure to delight. 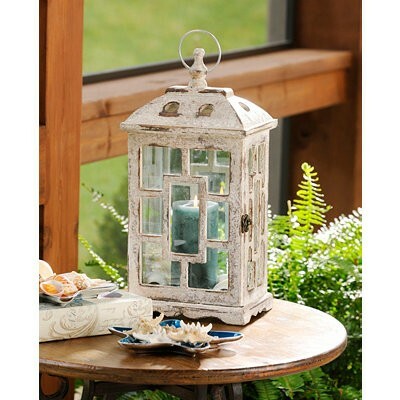 Lantern measures approximately 8.25L x 6W x 16.5H in. Crafted of wood and glass Antiqued white finish Yoke design with stately traditional style Features a hinged door and rectangular accents Accommodates one (1) 3" diameter pillar or sphere candles; candles sold separately Care: Dust with a soft, dry cloth. Safe for covered outdoor use.